Source: Adapted from Lovely, Weber & Staniforth (1958). two untimely hoeings reduced it only 38% (Table 4.4). Similarly, Mulder & Doll (1993) found that three rotary hoeings controlled weeds better than two hoeings, and Mohler, Frisch & Mt. Pleasant (1997) found one to two hoeings inadequate in some years. However, VanGessel et al. (1995a) found one well-timed rotary hoeing as good as two. 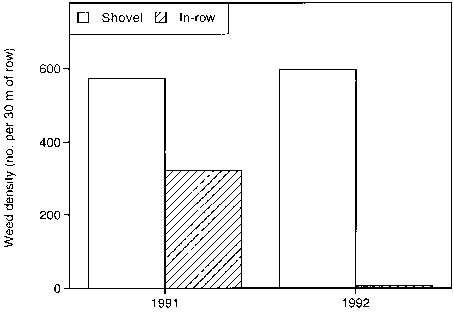 Mohler & Frisch (1997) found a rotary hoe about as effective as a spring tine weeding harrow for weed management in oat. Wet soil conditions reduce the effectiveness of rotary hoeing (Table 4.4). Wet ground limits soil movement by the implement, and rainfall or irrigation soon after rotary hoeing probably reduces the percentage of weeds that die by desiccation. Harrows vary greatly in design, but all consist of a frame with many downward pointing, small diameter tines. Although chain harrows and spike-tooth harrows are still successfully used for weed control, spring-tine harrows are rapidly replacing these more traditional designs. The tines on spring-tine harrows are either spring steel wires (typically 4-7 mm diameter), or else rigid metal fingers attached to the frame with a spring. Their popularity as weeding tools comes from a greater ability to adjust down pressure and hence aggressiveness, coupled with the ability of the tines to spring over or around well-rooted crop plants. Nevertheless, comparison trials have not demonstrated superiority of the spring-tine design over older types of harrows (Rasmussen, 1992a; Wilson, Wright & Butler, 1993). times use to comb sprawling and vining weeds like Stellaria media and Convolvulus arvensis out of cereals shortly before stem elongation of the crop (Kress, 1993; Wilson, Wright & Butler, 1993). In this application, the tines do not penetrate the soil. 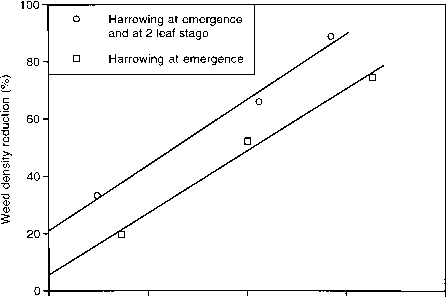 With large-seeded row crops and transplants, opportunities for harrowing are more continuous, although beans are sensitive at the crook stage (VanGessel et al., 1995a). 1995; Mohler & Frisch, 1997), so the utility of harrowing cereals is questionable. Harrowing is unlikely to increase yield unless the predominant weed species are sensitive to harrowing, their density is high, and the operations are timely relative to phenology of the weeds. 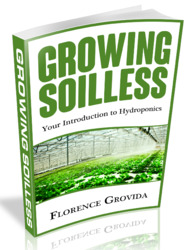 However, harrowing may be useful for decreasing future weed pressure even when it does not increase yield of the current crop. In contrast with the situation in cereals, several studies have shown that weed control with harrows increased yield of large-seeded crops like pea, broad bean, and maize (Baumann, 1992; Rasmussen, 1992b; Mohler, Frisch & Mt. Pleasant, 1997; but see Boerboom & Young, 1995). VanGessel et al. (1995a) found that harrowing pinto bean significantly improved weed control and gave yields equivalent to the weed-free check. Deep planting and fast early growth of large-seeded crops allows aggressive harrowing soon after emergence, whereas this is not possible with cereals. 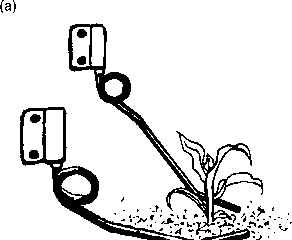 Although harrows are used for seedbed preparation in smallholder agriculture (Intermediate Technology Publications, 1985, pp. 21-3), their use for weed control is rare, possibly due to lack of appreciation for the benefits of killing weeds in the white thread stage. 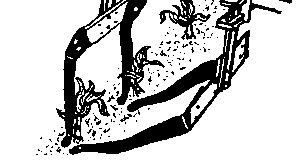 The use of hand- or animal-drawn chain harrows shortly after planting could substantially reduce the labor requirements for later hand-weeding in some systems. Several tools using different soil-moving principles are available for in-row weed control in row crops. These are all precision tools that must be carefully set for depth, distance from the row, and in some cases, angle, to achieve good weed control without damaging crop plants. They are best used in a front-mount or belly-mounted position, or with a guidance system. A smooth, flat seedbed improves the consistency of weed control. Torsion weeders are spring steel rods that reach within a few centimeters of the crop row and travel 2 to 3 cm below the soil surface (Figure 4.15). The compressive action of the springs causes the soil in the row to boil up, thereby disturbing weeds in the row that are not yet well rooted. Larger weeds next to the row may be sheared off as well. Spring hoes work in a similar manner, but are more robust and aggressive (Figure 4.15). Both types of tools are usually mounted on inter-row cultivators forward of the shovels or rolling gangs. 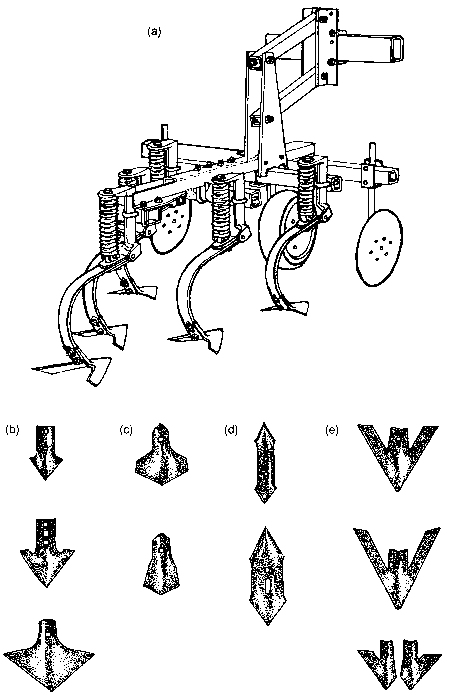 Several studies have shown improved weed control and crop yield by cultivators equipped with these tools in combination with spinners and spyders (see below) relative to standard shovel cultivators (Figure 4.16) (Schweizer, Westra & Lybecker, 1994; VanGessel et al., 1995b, 1998; Mohler, Frisch & Mt. Pleasant, 1997). Stiff, heavy-duty spring hoes are available for work in orchards and vineyards. These scrape the soil surface free of weeds in and near the row. A castor at the tip allows the tool to bend past trunks without scraping the bark.